The first city-to-city television broadcast took place on this date in 1927. Secretary of Commerce Herbert Hoover was in a studio in Washington, D.C., and an audience sat in an auditorium in New York City. 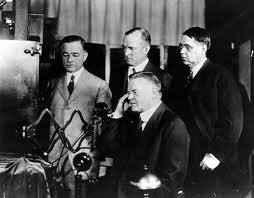 The broadcast began with a close-up of Hoover’s forehead, because he was sitting too close to the camera. He backed up and said, “All we can say today is that there has been created a marvelous agency for whatever use the future may find with the full realization that every great and fundamental discovery of the past has been followed by use far beyond the vision of its creator.” He was followed by a comedian performing jokes in blackface.